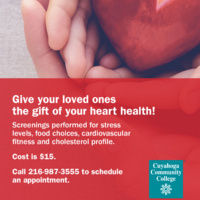 Give your loved ones the gift of your heart health! Screenings performed for stress levels, food choices, cardiovascular fitness and cholesterol profile. Call 216-987-3555 to schedule an appointment.